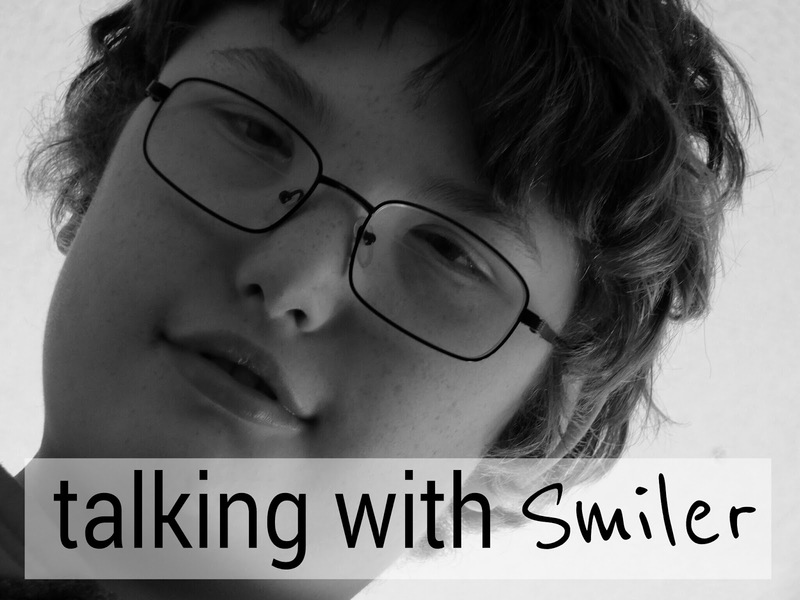 I guess some might think that title is misleading - after all, Smiler is officially non verbal (which is daft, because he speaks...ish), but for us, talking goes beyond words - it's communication, certainly, and perhaps more complex and involving than 'talking'. When you're discussing something with him, you have to take into account his facial expression, any Makaton signing he's using, his body language, words or fragments of words he's using, eye contact, and the situation as a whole. If you ignore any one of these, you can completely misunderstand him. I think of him as being able to talk, but I suppose objectively, the truth is not quite that straightforward. So, Smiler, did you have a good time at school today? Oh, so you had fun at school? What happened? Did Abby [child in his class] do something funny? What was it that Abby did that was funny? Did Abby laugh because someone else fell down? Who fell down? Was it an adult or a child? Was it a child in your class that fell down? Birthday? Do you mean Kate? [another child in his class] It was her birthday last week, wasn't it. Did Kate fall down? That doesn't sound very funny to me - poor Kate! Did Abby hurt herself, or was she okay? Who had a seizure? Kate? Did anyone have a seizure? Pretend? Did Kate pretend to have a seizure? Did Kate fall down and pretend to have a seizure? Arf. Tend. Tend add eas-er. It's not funny to pretend to have a bad seizure! Emma [one of the teachers] pretended to have a seizure too? Hang on, was this about the people who help us thing? Emma pretended to have a seizure so you could all help? Someone went to the office to get Sue [school nurse]? Abby laughed at Emma pretending to have a bad seizure? So who got Sue from the office? Someone pressed the buzzer to get Sue from the office? Who pressed the buzzer? So you were learning about people who help us, and Emma pretended to have a seizure, Abby laughed, and Kate pressed the buzzer to get Sue from the office? And it was great fun? We checked with the class team the next day, and found out the 'people who help us' topic had begun in ernest, with discussion of the people who help when someone in the classroom at school needs help. They role played someone having a fit - a part played by the teacher, Emma - and while talking about who helps if this happens for real, one of the more mobile children, Kate, had run and pressed the emergency buzzer on the wall, summoning help in the guise of Sue, the school nurse. Really impressive problem solving by Kate, but apparently Abby thought it was all very funny. Impressive communication by Smiler too, but you can see how being a passive listener wouldn't have worked - you have to constantly repeat back what you've heard and understood, for him to confirm or correct. Knowing the context makes a big difference with Smiler - he couldn't tell me the name of the child he wanted to tell me about, but was able to point me in her direction by referreferring to her birthday, which we spoke about earlier this week. Referencing someone or something - in this example, a child - through common knowledge that he knows we share - her birthday - demonstrates that Smiler's understanding is not as basic as it might seem from his (often) single word responses. Smiler remembers a lot of what goes on around him, and is able to be surprisingly precise about it afterwards, as long as you know the right questions to use to elicit his response, and how to interpret that response! Although Smiler has a reasonable vocabulary for a child with his level of intellectual disability (though of course not comparable with a standard or 'neuro typical' young person of his chronical age), he often skips the beginnings of words. Not just more complicated or long words, but words he is very familiar and comfortable with - such as 'yes'. We've never been able to definitively identify if this is due to a hearing impairment and he doesn't hear the beginning of the words we use and so doesn't emulate them, or whether he struggles with pronunciation (he has great difficulty controlling liquids in his mouth, which may be a result of coordination issues and / or lack of strength in his facial muscles and tongue). His hearing is reviewed every six months, but testing is getting tricky because he knows when the person sat in front of him stops playing with whatever toy is attracting his attention, the noisy toys at the back of the room must be going off, and there's a 50/50 chance that he'll turn to the correct side to see them. Now he usually refuses to turn altogether - he smiles at the person opposite him and laughs. He's teasing them - he knows they want him to turn, and thinks it's funny not to do so. But as I said, it makes it difficult to know what he does and doesn't hear! No one is entirely sure why it happens, but Smiler has a 'specific word finding difficulty' - words that he knows and is familiar with can sometimes get completely lost. I think of it as being similar to when you know what you mean, but call something a 'thing-a-me-jig' - you know? When the word is on the tip of the tongue, but you just can't think of it - hugely frustrating for everyone! There are also plenty of things he has an inexplicable but complete blank - on weetabix for example. For most of his life he's had weetabix (or at least the own brand version) for breakfast - as in he has it at least six mornings a week and has had since he was about one, but he still can't say anything approximating the word. He just draws a complete blank. He can tell you 'ot' (hot - he has it warmed in the microwave), get his bowl out of the cupboard, point at the box on top of the fridge, but not be able to make a sound that can be identified as weetabix. It's a mystery. Something else that gets in the way of communicating with Smiler is his intermittent stutter. When he's having lots of seizures or absences he often gets stuck on a word, and will repeat the same sound over and over and over and over, like a scratched record, without seeming able to move on. It doesn't seem like much of a problem, but at one point we were asked to time how long he got 'stuck', and we realised this was often over 60 seconds, with a single sound - 'ah - ah - ah - ah - ah - ah' - a minute is a long long time. We could restart the sentence with him, or say the word we thought he was trying to say, but it made no difference, he'd still get stuck. But hey, we were told when he was ten days old that he would never be capable of any manner of communication. At the end of the school day he can tell us about something that happened, and we can understand. So it's a win. This made me feel very proud. Not least because the first time I visited your blog I remember Smiler looking very young and you not knowing where his communication would go. This exchange is incredible, and hats off to you for being one amazing Mum as well.